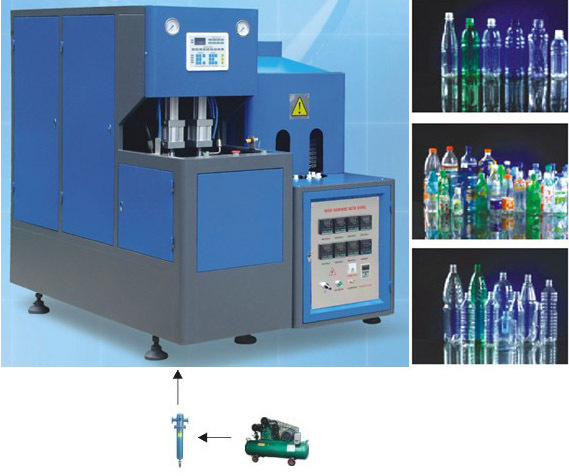 Blow molding machine is use to producing PET plastic bottles. Materials is the preform. Bottle design depend on the mold design. Semi-Auto semiautomatic bottle blow molding machine is suitable for producing PET plastic containers and bottles. It is widely used to produce the carbonated bottle, mineral water, pesticide bottle oil bottle cosmetics, wide-mouth bottle etc. The machine can be operated in the step-by-step mode and the semi-auto mode. The machine is small with low investment, easy and safe to operate. Stretch Blow Moulding Machine is suitable to produce differently shaped bottles from PET tube. It is widely used to produce Mineral water carbonated drink, candy sauce, juice, medicine, cosmetic and oil bottle etc. 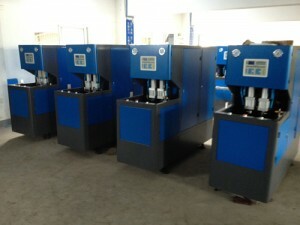 The machine adopts revolving infrared pre-heater. It ensures extremely even heating for PET preforms. The machine uses mechanical-double-arm mould clamping which ensure the mould be closed tightly even in high pressure. Infrared heating area is strictly divided into seven zones of A,B,C,D,E,F,G from up to down, Temperature requirements for all parts of pre-form are satisfied by controlling temperature of corresponding zones. 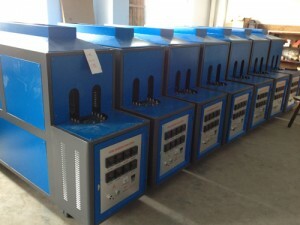 The feeding of pre-form for heating and taking away of heated pre-form shall be conducted manually which is simple and convenient.